Holy water (Theertham) : There are 8 theerthams; Of these, Jatayu Theertham is important. Sacred Tree (Sthala Vriksham) : Vilvam (Bael Tree). Timings : 06:00 a.m. to 12:30 p.m. and from 03:00 p.m. to 08:30 p.m. This is the 43rd sthalam on the northern side of river Cauvery. Thiruganasambandar has sung hymns in praise of Lord shiva of this temple. 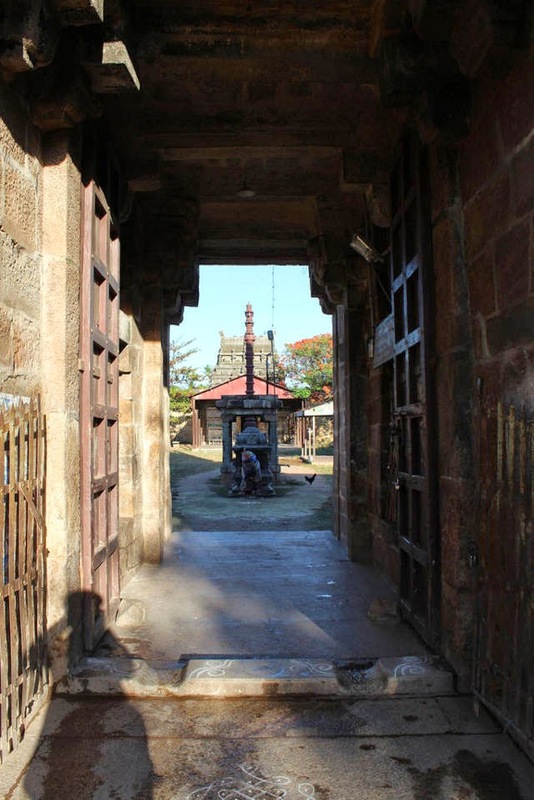 This is a well endowed and maintained temple with a five tiered Rajagopuram and 2 prakarams; this temple has housed some of the festival images of the Tirududevankudi temple nearby. Tiruvisalur is under the adminstration of the Thanjavur Royal Palace. Vilvam, Vanni, Punnai, Magizhamaram, Aalamaram, Nelli, Arasamaram are the trees found in this temple. 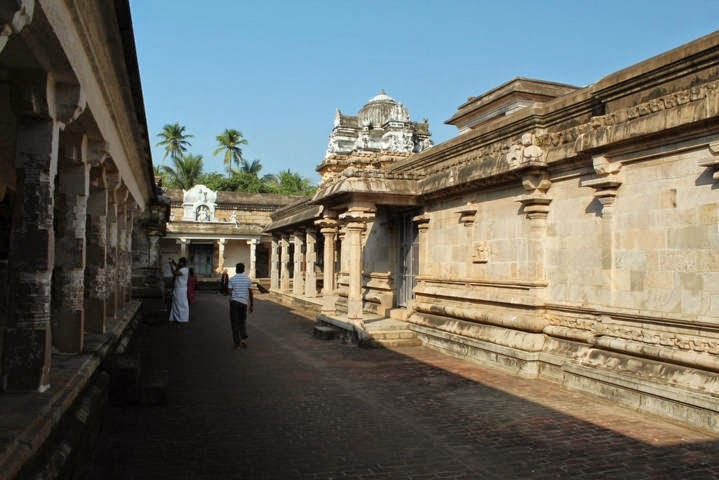 Yoganandeswarar Temple at Thiruvisanallur is a very ancient temple. 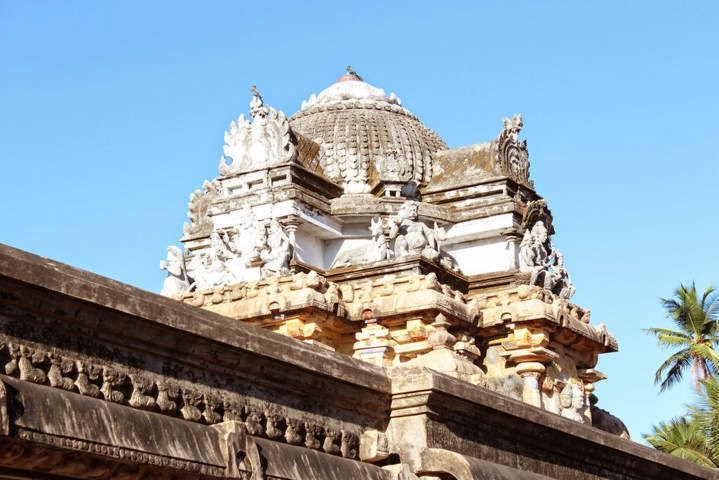 The presiding deity of this temple, Yoganandeswarar is also known as Sivayoginathar. Eight Shiva yogis after severe penance on Lord Shiva, merged with the Lingam and hence the name Sivayoginathar. This place was a vilva forest at one time and hence He is also called Vilvaranyeswarar. He is also known as Puradhaneswarar. 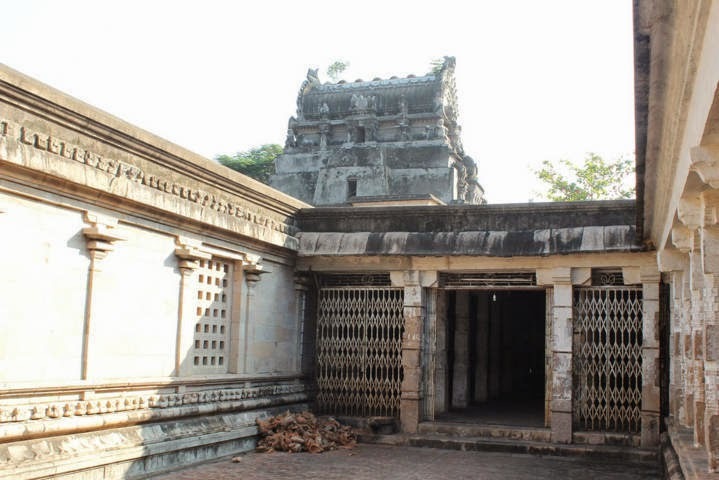 His consort here is known as Soundaryanayaki or Shantha Nayaki. The sthala vriksham is Arasa maram and the Theertham Jatayu Theertham. Chatur Kala Bhairavar is famous here. 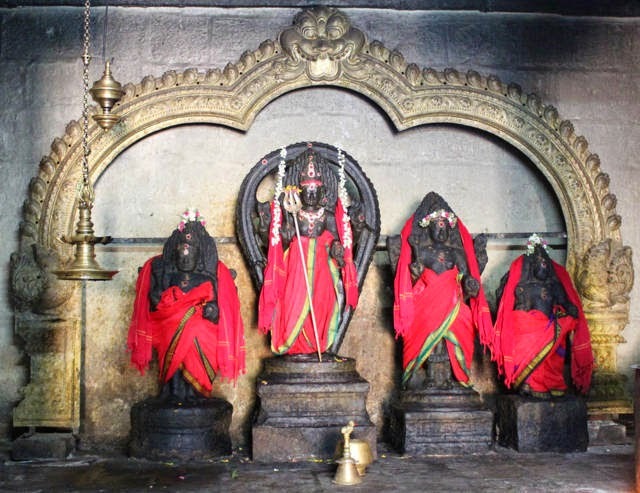 The four Bhairavars with Saneeswara Bhagawan and Sivalingam on their sides denote different periods of life and praying here will solve our problems for our entire lifespan. Gnana Bhairavar : The Brahmacharya phase of the human life is dominated by his quest for knowledge. Gnana Bhairavar bestows good education and good employment on his devotees. Swarna akarshana Bhairavar: In the Grahasta phase, Swarna akarshana Bhairavar blesses his devotees with excellent growth in career and material gains. Unmattha Bhairavar: In the Vanaprastha phase, His devotees are blessed with good health, financial stability and good luck. Yoga Bhairavar: In the Sanyasa stage of life, a man is supposed to be totally devoted to God. By praying to Yoga Bhairavar and the Kailash Lingam beside the Yoga Bhairavar, man attains salvation. The objective of existence is to try to merge the jivatma (individual self) with the paramatma (God). This is known as moksham or liberation from the cycle of birth and death. The four ashrams prepare a person to undertake the process in a controlled but directed manner. Devotees who worship Chatur Kala Bhairavar during the 8th day of the waxing period (ashtami of Sukla paksham or valarpirai) gain in prosperity and advancement in business and career. Devotees worship during the 8th day of the waning period (ashtami of Krishna paksham or theipirai) to get cured of their diseases, peaceful family life, protection from evil spirits and envy. Lighting oil lamps with black pepper on eight consecutive Sundays during Rahu kalam 4.30PM to 6.00 PM at Bhairavar’s sannidhi results in getting back lost property and wealth. The Sunlight Pooja on Chithirai 1, 2, and 3 is a significant one. On the last day of the Aipassi month, the Panca moorthis go on procession – Theerthavaari at Kaveri. Aarudra Darshan on the Maha Sivarathiri Day. Other celebrations are on Pratosham, Thirukkaarthigai and on the Karthigai Somavaaram (Mondays). Once a man who was a habitual sinner was about to be taken away by Yama. This man had only indulged in evil deeds and had not not anything good to anybody all his life. This man came running into the temple to escape from Yama and was shouting and pleading to Lord Shiva to save him. Nandi turned his ears towards the entrance of the temple to hear the cry of the man and informed Lord Shiva about the same. Though, this man was a habitual sinner, Lord Shiva blessed him with papa vimochanam (absolution of sin) and Mukthi because he had come to Shiva with total devotion. 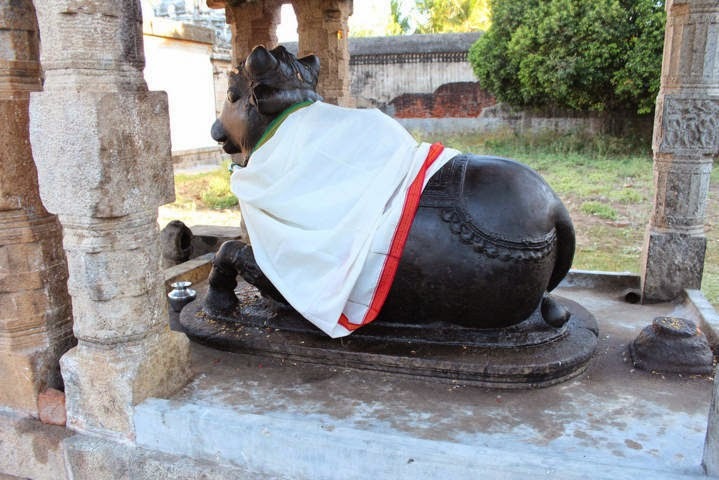 It is to be noted that you can see the idol of Nandi with its head turning to a side. 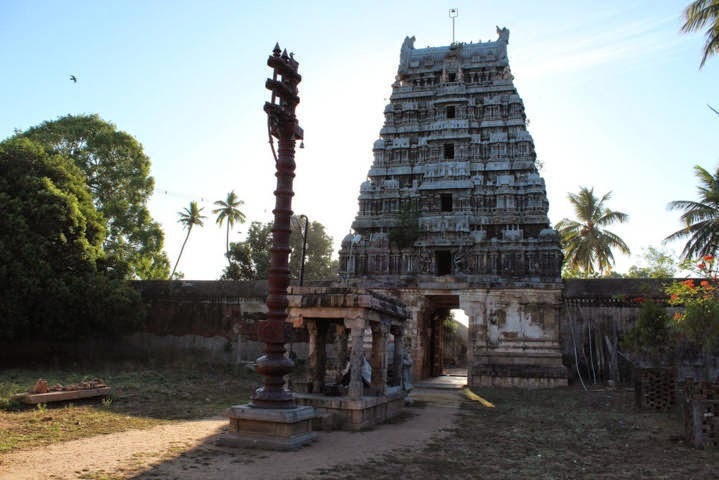 It is believed that those who pray to Him here during the Pradosham (Twilight period in the evening on the 13th day of every Lunar fortnight) will be absolved of all their past sins. There is also a sannadhi for Lakshmi and Narayanan which is a rare. Vishnu and Lakshmi are supposed to have got the blessing of Shiva here for their marriage. Worshiping Lakshmi Narayanan on shravan nakshatra, ekadasi and Saturdays is considered special. Devotees who light 6 oil lamps and offer Tulasi garland to this deity for six consecutive weeks are blessed with progeny, peaceful family life, removal of obstacles in marriage and general prosperity. 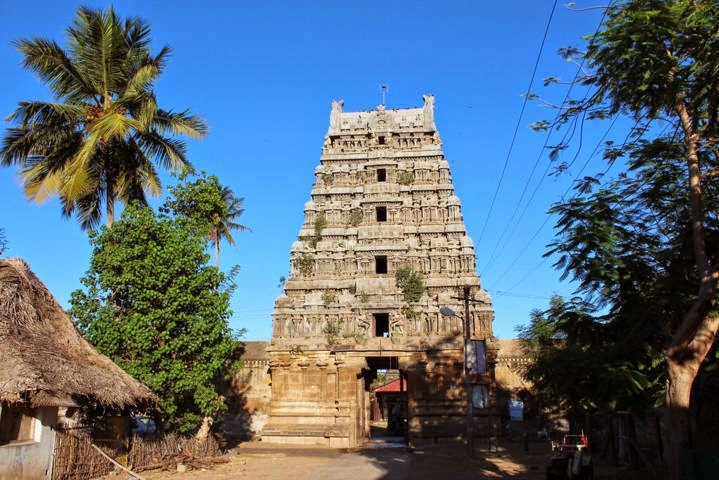 There is a Sun Dial in the periphery wall of this temple opposite to Ambal’s Sannidhi, which is a symbol of the scientific advancement during the Chola period. 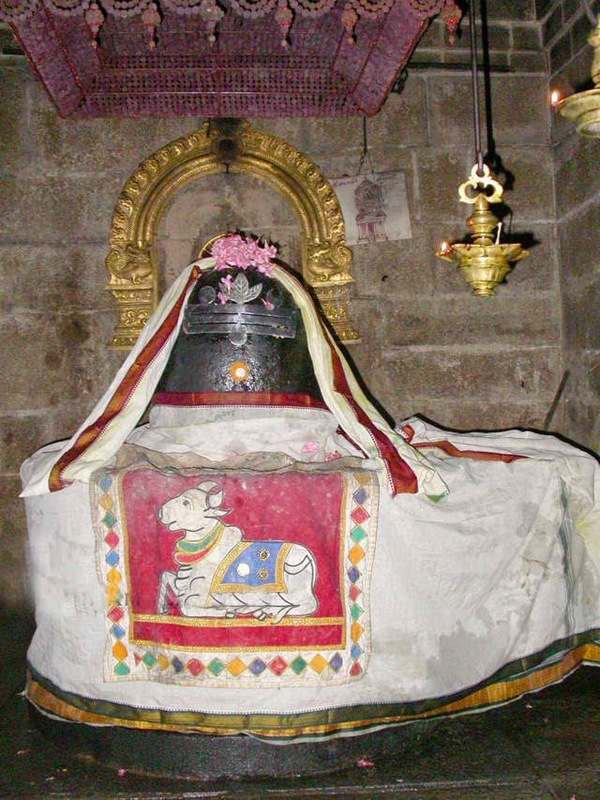 The Prime Deity of this place appears as Swayambu Lingam facing east. On Chithirai 1, 2, and 3, the Sunrays fall on the Lingam. Scientific based: The Sun-Dial : Near the southern temple wall is seen the Sun-Dial fixed some 700 years ago. This clock is constructed in such a way to measure the route of the sun from the sunrise in the morning till the sunset in the evening. A semi-circle is made and the numbers from morning 6.00 to evening 6.00 are carved around. In the center, a brass nail is fixed. When the sunlight falls on this nail and on the number where its shadow falls, is that time at that moment. This is an excellent instance to show that the Tamils were experts in the Astronomical Science. The legend says that this sacred place has seen all the four yugas. The deity is worshiped as Puraathaneswarar in the Kritha Yuga, Vilvaaranyeswarar in the Tretha Yuga, Yoganandeeswarar in the Dwaapara Yuga and Sivayoginaathar in the Kali Yuga. 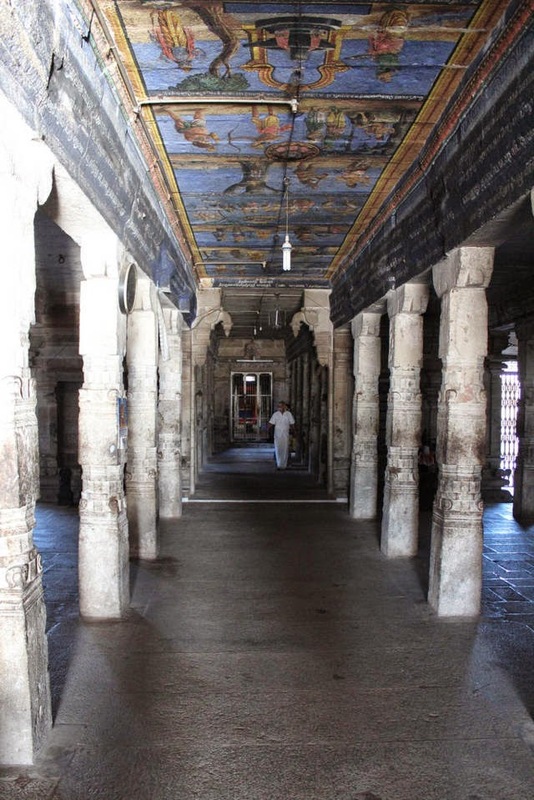 Uyyavantha Devanaayanaar, the author of the Siddhanta Sastra work Thiruvunthiyaar was born in this holy place. The tradition is that Sage Agasthya worships this deity on the Sivarathiri days. 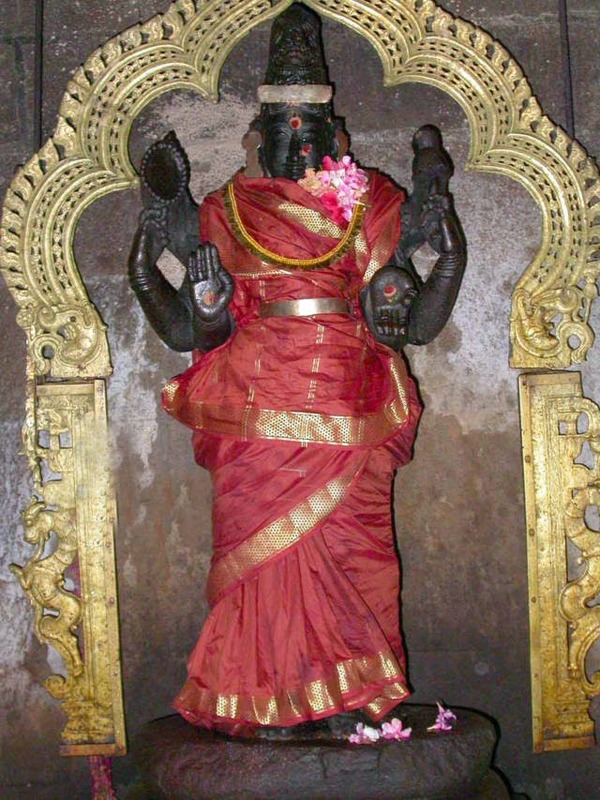 In some of the Siva temples Perumal is seen alone; but, here He appears as Lakshmi-Narayanan, along with His spouse Lakshmi. It is said that during the Ramayana days, Jatayu’s feather fell in this place, where now is the ‘Jatayu Theertham’. This is the temple for Rishabha Rasi. 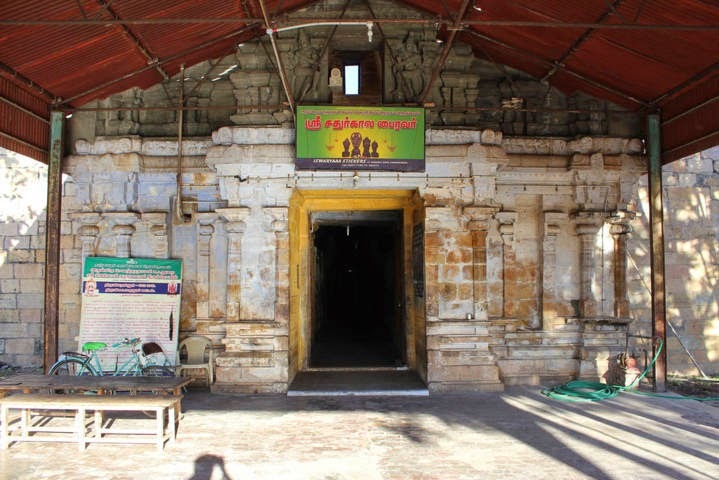 People born under Rishabha rasi are recommended to visit and pray at this temple regularly. Sridhara Ayyaval’s ashram is in this village. There are few miracles about his life. Devas and Pithrus are believed to have partaken in a meal when he conducted Shraddham for his father, although the local Brahmins refused to attend. Once on a New Moon day, he brought Ganges to the well in his house for purification. He is also credited with restoring life to a young man, out of compassion for his parents. 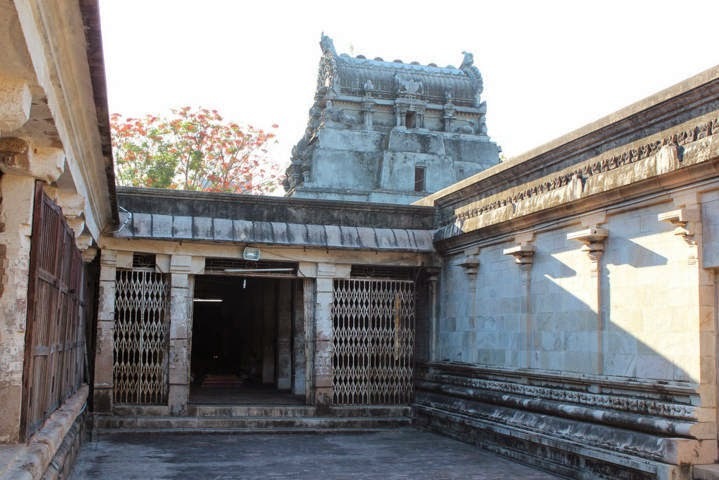 Sridhara Ayyaval is reported to have vanished after entering the Sanctum Sanctorum of Madhyarjuna Siva temple at Thiruvidaimaruthur. About 300 years ago, one Sridhara Ayyaavaal was performing the yearly parental offering (divasam). At that time, a person begged alms because of hunger. Tradition is that alms should not be given at that time. But, he gave food to that hungry man. So, the village people ostracized him from the village. They said that to absolve this sin, he should take bath in the Ganga. Sridhara Ayyaavaal prayed to the Deity of this place and Ganga flowed in his house well. Lord Brahma, the God of Creation was born as a son to one Vishnu Sharma. Along with him were born six yogis and he with them performed tapasya to Lord Siva. On the Sivarathiri day, Lord Siva appeared before them, made them as seven lights and merged them with Him. Hence, the deity of this place became ‘Sivayogi Naathar’. By way of explicating this legend, we can see even today in the body of the Sivalingam seven hair-locks. Once a person who had committed numerous sins, exhorted the Lord of this place in his last moments. Lord Siva, then asked Nandhi: “who calls me?” and Nandhi turned to find out. (In this sacred place the Nandhi image is in the turned posture). It was a ‘Pratosha Day’ when the person called the Lord. All his sins vanished with Nandhi’s seeing him. His life had to end at that moment. Lord Yama came there and Nandhi stopped him. There arose a fierce quarrel between them. Nandhi won Yama and sent him out, away from the flag-post. Usually in the temples Nandhi will be seen inside the flag-post. But, we can see Nandhi in this holy place outside the flag-post. Phone: 0435-200 0679, 94447 47142. For details Mr Ramanathan may be contacted through his land line 0435 – 2941752 and mobile 9790116062.